Summer is officially just around the corner, and the pools throughout Florida become the ultimate destination for a refreshing dip in the pool; an afternoon relaxing with friends, family or a good book; sipping a delicious poolside cocktail; or simply enjoying the Florida sunshine. Outside of packing the essentials (sunglasses, sunscreen, phone, tablet, book, etc. ), these resorts have everything you need poolside, and they know how to cater to their guest’s every need and desire. With upgraded cabanas, world-class hospitality and inventive drink menus, these resorts make LuxeGetaways’ list of the top 20 Florida pool experiences. So, dive into Florida’s best hotel and resort pools this season… and to assist in making the experience even more refreshing, LuxeGetaways has a few suggestions from the drink menus included for each destination. Sky High Swim: The iconic Conrad Miami, located in the heart of chic Brickell Avenue, features a rooftop pool flanked by plush poolside cabanas. Guests can kick back with a selection of handcrafted cocktails delivered from The Bar at LvL 25, including the refreshing Acai Rita, made with Don Julio Tequila, Cedilla açai liquor and fresh berries, while enjoying 360-degree views of the Miami cityscape and Biscayne Bay. Palm Beach Perfection: The Mediterranean-style Beach Club fuses the timeless grace of Palm Beach, the relaxed formality of the French Riviera, and the seaside charm of the Italian Coast, The Breakers beachfront dazzles even the most traveled guest. Four refreshing oceanfront pools include the resort’s main pool; a 25-meter adult pool; the south pool; as well as dynamic the active pool ideally suited to families; as well as five relaxing whirlpool spas. Located along a half-mile of private beach, and to create the ultimate poolside experience, the collection of poolside bungalows is perfection. Three favorite cocktail options here include the Basil Colada to go all-out, the Skinny Margarita if you’re watching your calories, and one of the organic detox pressed juices for a non-alcoholic option. Vibrant Paradise: The oceanfront W South Beach features two picturesque pools – the 4,000-square-foot WET main pool and Mini WET – offering the ultimate in tropical luxury, complemented by first-class service. Guests are invited to bask in the South Beach sunshine as poolside attendants serve up all-natural cocktails and organic cold-pressed juices. Jaunt to Jupiter: Jupiter Beach Resort & Spa is the area’s only oceanfront hotel, spread across a private stretch of golden Atlantic coastline in the laid-back, coveted vacation destination. Activity at the resort is centered around the swimming pool area, which features a Sandbar with light bites and cocktails, sunblock/aloe station, hammocks and opium beds for lounging with spectacular ocean views. Twin fountains arching above the pool create a scenic spot where guests can cool off after a day in the sizzling South Florida sun. Make it complete by trying a few of their signature drinks, such as their Fresh Agave Mojito or Jupiter Crush. Secluded Fort Lauderdale: Set on 16 secluded acres amid South Florida’s largest private beach, greet the Florida sun from the lagoon pool at Fort Lauderdale Marriott Harbor Beach Resort. Overlooking the Atlantic, catch glimpses of guests bungee jumping in the ocean. Turtle advocates can toast to the Tipsy Turtle cocktail where with a portion of proceeds are donated to the National Save the Sea Turtle Foundation. Towering Bamboo and Tropical Plants: Set in the heart of Miami Beach, The Palms Hotel & Spa combines relaxed sophistication and oceanfront serenity to create an elegant sanctuary, where wellness and environmental awareness are at the center of each guest experience. Surrounded by towering bamboo and lush tropical landscaping, the pool is an oasis amid the hustle and bustle of Miami Beach. Enjoy the serenity while sipping on one of their Watermelon Mojitos or Pain Killers — also ask the bartender about the daily special cocktail. Steps away, Tiki Cabanas are available for day rental, and furnished with two lounge chairs and a table, as well as privacy curtains and a host of amenities. Guaranteed Sunshine: The Hilton West Palm Beach is home to views of countless palm trees and never-ending sunshine. The pool boasts a floatation menu blow-up whimsical unicorns and swans or dry off with glow-in-the-dark bocce ball. The half-acre lanai delivers Mediterranean vibes via music curator, The Vegan DJ, Adam Lipson, custom bourbon blends and local craft beers. Indulgent Oasis: For a respite from the nearby Disney theme parks, the two pools at Waldorf Astoria Orlando and Hilton Orlando Bonnet Creek feature views of the property’s lush golf course, lazy river and even Epcot’s nightly fireworks display. After a dip, guests can sip on tropical cocktails (Mandarin Mojitos, Caribbean Coolatas, Blue Lagoons) from Beech Bar and soak up the Florida sun. Newly Renovated Pool Deck: One of the only hotels perched right on the sand of Ocean Drive in Miami Beach, Stanton South Beach boasts two glamorous pools (side-by-side) that overlook stunning views of the rolling ocean waves. Adjacent to the pool, the new outdoor terrace serves as a hang-out spot for guests and locals to meet and mingle. Complete with private cabanas, lounge seating and stunning greenery, the terrace is the perfect spot to settle in whether you’re reading a favorite book or enjoying happy hour cocktails or delicious bites from the hotel’s in-house restaurant & bar Deco Blue. The Beach Club Experience: A pool oasis at Boca Beach Club is a beautifully designed pool area located at the Boca Beach Club, with three swimming pools, an oceanfront bar and upgraded cabanas. The Beach Club is just a short drive away from the primary resort, The Boca Resort & Club, a Waldorf Astoria Resort; and these two properties both provide amazing resort experiences. The Beach Club looks over a half-mile of private beach, and provides limitless ways to explore the sand and the sea; or just lounge by one of our three swimming pools for luxurious poolside relaxation with the entire family. Cocktails by the pools or in your private cabana can include their unique favorites like the Lychee Margarita or Cactus Dragonfruit Punch. Fit For Five-Star Families: The first five-star family resort in the Disney area, Four Seasons Orlando at Walt Disney World Resort features a brand new pool paradise — perfectly fit for five-star families. Created by landscape design experts EDSA, the hotel’s Explorer Island features a Family Pool, Splash Zone, Lazy River and The Drop, which features two 242-foot thrilling waterslides. While the kids enjoy the pool, adults can sip Skinny Dip, Tiki Torch and Explorerita cocktails at the nearby PB&G lake and poolside restaurant. 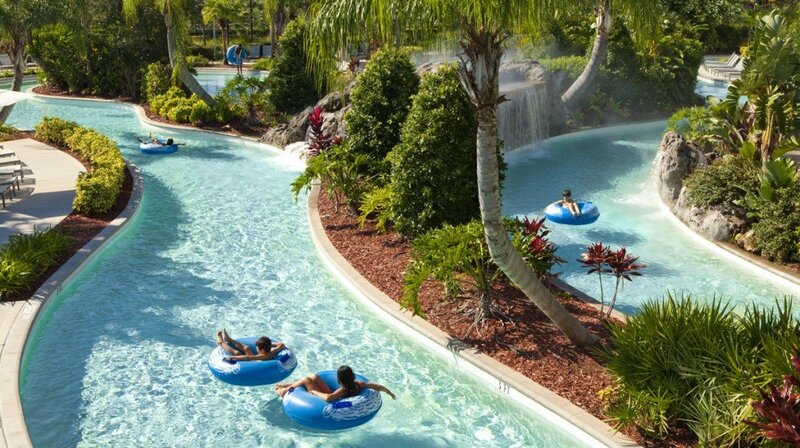 Lazy River Adventures: Guests can relax and quench their thirst poolside at Hilton Orlando’s Tropics Pool Bar & Grill. Boasting its own 892-foot winding lazy river, adults-only pool and main pool guests can indulge in a myriad of adventures. Tropics serve a variety of innovative cocktails like the Spicy Strawberry Smash, which combines Bacardi Dragon Berry Rum, lime juice, strawberries, jalapenos and club soda. Gulf Front Relaxation: Boasting a prime waterfront location overlooking the Gulf of Mexico, the Caloosahatchee River and San Carlos Bay, guests at the Westin Cape Coral Resort at Marina Village can relax poolside and enjoy seasonal rum flights from The Nauti Mermaid, which features locally distilled rum from the award-winning Wicked Dolphin Rum Distillery. Be Among The First To Visit: The Playa Largo Resort & Spa will open this summer as the first new resort to be built in the Upper Keys in more than 21 years. This new addition to Marriott’s exclusive Autograph Collection is just a short drive from Miami and is located on 14.5 acres with 745 ft. of beach. The resort will offer a private marina, three restaurants, tiki bar and an expansive beachfront featuring a resort pool surrounded by cabanas, as well as a spa pool and fire pits for evening sunset celebrations. With this amazing environment in an entirely new development, any frozen drink with an umbrella will complete this Playa Largo experience. Simply South Beach: Going down to the pool at Loews Miami Beach is a unique experience to say the least. First, it’s South Beach, so people watching can provide hours of enjoyment, but this paired with the over-the-top pool just steps away from the beach and the uber-trendy SOAK providing luxurious cabana services takes the visit to the pool to an entirely different level. Loews Miami Beach loves palm trees so much, that they even have one etched into the bottom of the pool. If you’re ready to settle in poolside, make the most of it—enjoy our little touches of luxury, like Evian misting, frozen grape kabobs and delicious chilled fruit smoothies courtesy of their Poolside Concierge. To keep things lively, there is also a whole host of fun activities available, including raft races, limbo contests and Dive-In Movies. Cocktail time? Consider the hand-shaken Hemingway Daiquiri or old school Mojito. Scintillating Sunbathing: W Fort Lauderdale’s oceanfront Wet East infinity pool invites guests to play peek-a-boo with swimmers through the pool’s translucent walls. Whether slipping in to an outdoor hot tub or sliding up to the gas-powered fire pit overlooking South Florida’s sugar-sand coastline, the views in and out of the pool are sure to heighten your senses. Guests looking for the ultimate relaxation by the pool can book private WET Cabanas and enjoy a bliss spa treatment or just to kick back with cool beverages and lite bites, as well as flat screen TVs. Priding themselves on their colorful cocktail, consider giving Guava Sin or Miami Vice a try. The Southernmost Point: Located directly on Key West’s only private natural-sand beach, The Reach, A Waldorf Astoria Resort, is an intimate, elegant destination for those seeking a casual retreat with the highest level of service. Guests lounging by the pool will savor their idyllic oceanfront surroundings with sweeping panoramas of the Atlantic Ocean. Regional seafood and handcrafted cocktails are delivered poolside, and at some point during your stay, a Casa Key Lime Colada is a must. Ultimate Fun Under The Sun: The recently revamped Hyatt Regency Coconut Point now boasts a 5,000-square-foot Adventure Pool featuring 140-foot corkscrew slide, 2,700-square foot Roman-style Waterfall Pool, and lagoon style pool, each designed by landscape architects EDSA and all perfect for cooling off under the Florida summer sun. Guests who prefer to relax poolside can enjoy a refreshing Killer Colada, Rum Runner or Coconut Point Sunrise cocktail on the spacious deck, ideal for sunning or enjoying shade under the covered pavilion. Refreshing Dip After Golf: The zero-entry resort pool is a centerpiece of PGA National Resort, surrounded by every amenity you could want, like live entertainment and lounge chair service, complete with towels and refreshments. Guests of their Sports & Racquet Center and The Spa at PGA National will discover additional pools for fitness and relaxation. The new addition of iDECK is fantastic for food and drinks, as it’s a 3,000-square-foot terrace with serene lake views and a picturesque pool vantage. Be sure to inquire about their favorite drinks like Opal’s Cosmo or Bev’s Revolver. An Art Deco Gem: The National Hotel on South Beach is home to the longest infinity-edge pool in Miami Beach, Florida. The 205-feet-long pool is nestled amongst native palms, bougainvilleas and tropical foliage and surrounded by private cabanas. It is complemented with a stunning pool deck where guests can enjoy poolside dining and relaxing massage services. The pool complex includes a second leisure pool, heated and set near to The National’s own private sandy area. Here, the infused martinis and pitchers of sangria are a crowd favorite.